The lighting in a home changes the mood of a room just as it does the perceived size of a room. Placement and type are important aspects of interior design, and they work in conjunction with color selections, room size, availability of natural light and furniture selection. So, today we’re showing you how you can make the most of your industrial lighting. Like a vintage microphone on top a stage, Lee standing lamp will steal the attention to it. The ideal corner piece for a demanding setting. It’s a mid-century lighting design classic. This piece is handmade in brass and its lampshade in aluminum. Like a precious jewel, Meola is a good decorative element with a discrete size. Perfect on top of a sideboard or console. 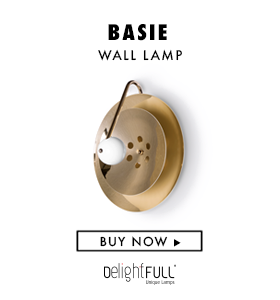 Its structure is handmade in brass, the lampshade in aluminum and the base made in foundry. This two table lamps will make a statement in every single industrial loft: Marcus and Diana are ideal for side tables and ofﬁce desks. Ella suspension is a design masterpiece; with its sober lines it has surpassed the test of time. A style icon of the ﬁfties and sixties suitable for any living room or dining room. Dizzy confers a classic form. Lit, it gives any space a different and special atmosphere. A ﬁne decorative element. Its structure is handmade in brass and the lampshade in aluminum.